Don’t Throw Away Your Pumpkin Seeds!!! 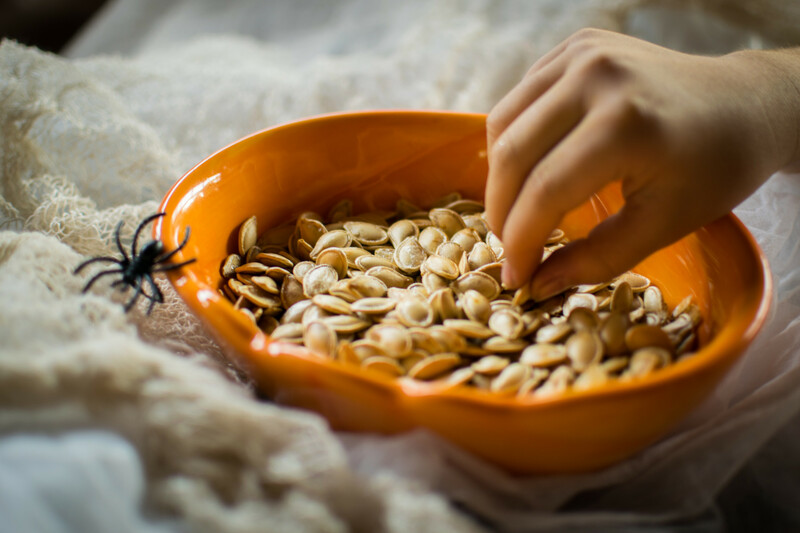 This isn’t much of a recipe, but we need to band together and prevent unnecessary throwing away of pumpkin seeds every Halloween! 😀 😉 See how easy it is to make these delicious snacks, which are a great alternative to chips! Do it!! This isn't much of a recipe, but we need to band together and prevent unnecessary throwing away of pumpkin seeds every Halloween! 😀 😉 See how easy it is to make these delicious snacks, which are a great alternative to chips! Preheat your oven to 300 F.
Carefully cut a lid on the top of your pumpkin. If you are carving this pumpkin, then make a notch in the cutout so you can easily tell how the top goes back onto the pumpkin. With a knife, cut off the pumpkin seeds and pulp off of the lid. Using a sturdy spoon, scoop out the rest of the pumpkin seeds in the pumpkin. Scrape the sides of the pumpkin to clean it out nicely. Separate as much of the large chunks of pulp from the seeds as possible. Put the seeds in a large bowl, then fill with water. The leftover pulp should sink, while the seeds float. If pulp is sticking to the seeds, separate them using your fingers. Gently scoop the floating seeds off the top, and let them drain in a colander. Oil a baking pan, and place the seeds in a single layer. Bake at 300 F for 30 minutes to dry them out. Add a little oil to the seeds, and toss them so that the seeds are coated. Lightly sprinkle on salt, then put them back in the oven for 20 minutes, or until golden brown. If after 20 minutes, they are not golden, you can also broil them for a minute or so to add color.